Two people I know and care for have recently told me that they feel like they no longer believe in God. They felt that though they kept praying and believing in God, their life is not turning out to be what they expected and hoped it would be. One of them asked me, is it right to lose hope or not believe anymore? I answered "No, it isn't right." Here's why. God has a better plan for us. I know it sounds cliche but it really is true. I am someone who has been through a lot and when I say a lot, I mean A LOT. I come from a bad relationship where I was cheated on, beaten, abused, and used. I was made to feel small, doubt myself, and feel like I was no better than a cockroach. I became a single Mom after that. I received no support (emotional or financial) from my ex and he gave nothing to our son. I had to work double hard to ensure that my son will receive what he needs in life. I entered another relationship where I wasn't appreciated because I thought I couldn't do any better. It ended badly. I am not financially stable and I am restarting my career. At 32, I am only starting to stand up on my own. I am not in a good place but I know that I will get there. I've just been recently dumped by the guy who I see myself spending eternity with. Oh and my grandmother died last Monday. So what's with the sob story? In spite and despite all these trauma, heartbreak, and tears shed, I still believe in God. I still believe that He has a better plan for me. I still believe that somewhere along this dark and cloudy skies, there will be a rainbow at the end of the road. I need to believe that. I need to have faith. If I lose it, then all will be lost. That can't happen. I cannot allow that to happen. FM and KF, you cannot let that happen. You cannot lose faith. You need to hold on to it if its the last thing that you do. You need to believe that God is not giving you what you want because He either feels you are not yet ready or because He has something better in store for you. 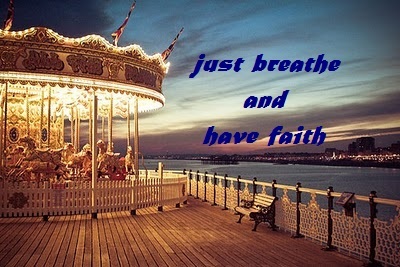 For now, while hell is breaking loose, JUST BREATHE .... breathe and HAVE FAITH. I say why not? What can you lose by having faith? Such a thoughtful post to have been written for your friends who need it the most. Sometimes, we just feel like our heads are just bobbing up and down in an ocean of trials and desperation, but we have to still try to swim through it. I have always been a firm believer that there is always a reason for everything. Sometimes we don't see the reason why sad and bad things are happening. But we soon realize the wisdom behind it. I hope your friends will not give up. I hope they'd think of more reasons to hold on. I wish them well.